Voting Closed for the Top 100 Hong Kong Movies of the Eighties. Countdown sometime soon. Voting has officially closed on the TOP HONG KONG MOVIES OF THE EIGHTIES, which we can now officially call the TOP 100 HONG KONG MOVIES OF THE EIGHTIES because enough votes for enough movies have been submitted. 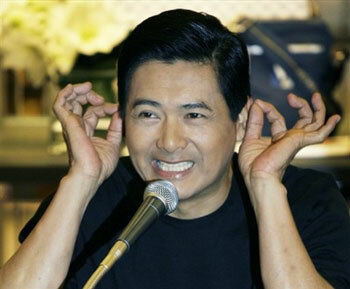 Chow Yun-Fat remains excited. All told, 135 people responded and 241 movies were nominated to make the final 100. There were about 13 films disqualified, e.g. any votes for a 1990 movie were ignored as this vote was intended to be from 1980-1989. Already the final ranking is shaping up and it has its share of surprises and also VERY expected outcomes. I capitalized “very” because you know those movies that you and your buddy voted for? Well, EVERYONE ELSE voted for them too. Add that up and you have a whole lot of people pushing THE FLYING MR. B. Just kidding, nobody voted for THE FLYING MR. B nor did they vote for PORKY’S MEATBALLS or THE NOBLES - which is a tragedy, because if you’ve seen the cover for THE NOBLES, you know that it deserves another look simply to see if it somehow foreshadows the legend that is Michael Wong. One surprising film that people did vote for is MISMATCHED COUPLES. Seriously, do you think that a movie starring Donnie Yen in eyeliner and a pink polo would have received any love had we held this vote in 1997? I say no. It’s only because Donnie is now DONNNNNIEEEE that we view MISMATCHED COUPLES with such overwhelming affection. 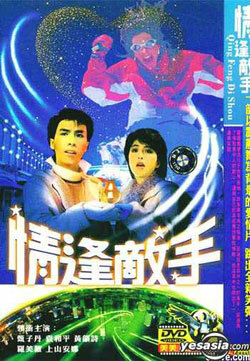 Then again, this Chinese DVD cover makes MISMATCHED COUPLES look like the greatest film EVER. By the way, you CAN expect to see MISMATCHED COUPLES somewhere on the list of Top 100. It’s in a dogfight with PEKING OPERA BLUES. One thing I do want to mention is that I hope the TOP 100 list doesn’t generate complaints, specifically ones like, “Man, this list is totally full of late eighties genre films! What kind of a BS list is this? I guess they should call the site ‘LoveHKLateEightiesGenreFilm.com!’” I bring this up because that’s exactly what some people said about our other TOP MOVIES lists. I hope people realize that our TOP MOVIES reader votes are not representative. They’re not authoritative. They’re in no way meant to be final, all-encompassing lists of the “best Hong Kong movies ever made.” This Reader Vote is being done for fun, and I ask that you have fun with it. If you can’t have fun with it, and simply must take it so seriously that the results offend you, then I guess there’s nothing we can do but cry in our car because we can’t meet your incredible expectations. With the voting out of the way and the tallying pretty much done, I’ll be digging up the poster images and writing up the blurbs to start the TOP HONG KONG MOVIES OF THE 80s countdown. You can expect it to start a week or two from now, depending on stuff going on around me like work, family, etc. When it does start, I’ll be pushing it on the site homepage, the Facebook group, the Twitter account, and probably on GetGlue, Path, Skype, What’s App, Letterboxd and Linked In because it’s a Web 2.0 world and you have to cover all your bases if you want to be popular. 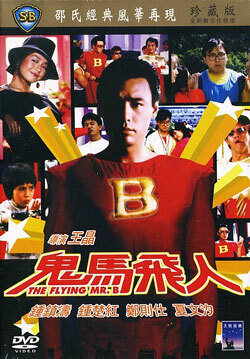 This entry was posted on Sunday, March 4th, 2012 at 3:16 am	and is filed under Top Hong Kong Movies of the 80s. You can follow any responses to this entry through the RSS 2.0 feed. You can skip to the end and leave a response. Pinging is currently not allowed. Me too!!! It was my first Chinese people dancing with kung fu movie?!!! Not sure there has been any before or since… well all the up to Kung Fu Hip Hop. I’m looking forward to seeing the less obvious choices. It’s always fun to find out about great movies that nobody really talks about. Also, that screen cap of Aaron Kwok is golden. I’m guessing it’s from DIVERGENCE? 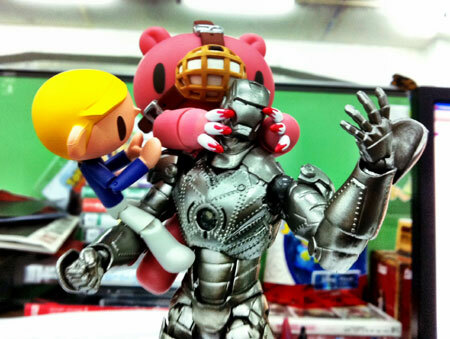 So many great possibilities for other captions to accompany that picture. “Mismatched Couples” just made my day. And the vote isn’t even out yet! Looking forward to more lost gems. It’s gonna be awesome. Hope it’s civil this time around for people’s reactions. Feel free to lump me in to the list of people who voted for every obvious pic, but hey I’m glad to have taken part this time. I’m glad the list was made up of 100 films as you seemed a little doubtful in other posts it would make it that high! I hope I can get this started relatively soon. List has been finalized, numbers have been crunched, but haven’t found all the images yet nor written all the blurbs. Compiling people’s quotes takes time, too. Hi A, we were only able to achieve 100 films on the list during the last few days. A rash of votes came in which made it possible. Thanks to everyone who voted those last days!